Is Moleskine French for Moleskin? I think it’s italian. Though they are not actually made from the skin of moles. Wow! Your moleskin collection is truly inspirational. 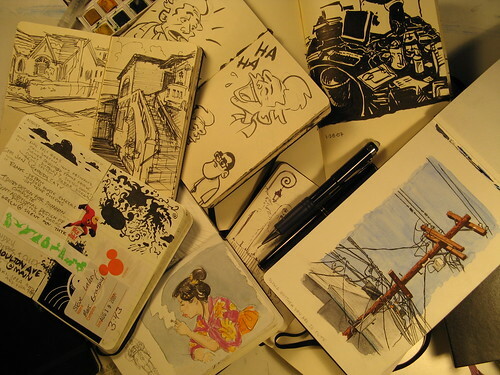 So many good sketches and layouts in your sketchbooks. Rock on! Wow! 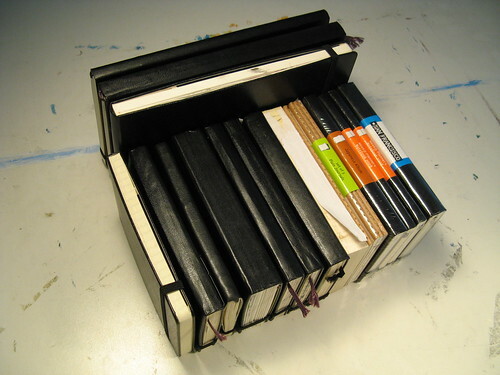 Great moleskin collection. They are truly inspirational - so many good sketches and layouts. Rock on! Gerald! — I’m not sure why I’m getting double comments sometimes. I think something’s up with the comment system and people think it’s not going through so they repost. Sorry for any confusion. ANYWAY… Thanks for your comment! I’m flattered that you found them inspirational. I certainly got the Moleskine bug. I’ve kind of left them alone for a little while, though. I think it’s time to get back into them. So hang on, what do you use for most of your sketching and so on? I mean, don’t you find working in the smaller space is difficult..? I just figured I’d get a new notebook/sketchbook to act as a reminder and sketch medium at some point soon.. And people seem to have a real Moleskine fetish. But, too small? Too big? Heavy? Light? Hi tali3sin — I do have them coming out the ears! My advice is that you just have to try things and see how you like them. I find some pros and cons to the Moleskines. The ones I think work the best for me are the planners and journals. When it comes to sketching, there are still a couple things to be desired in paper quality. But overall, I am taken with their portability and design aesthetics. The sketchbooks are good for inking, but not much else in my opinion. 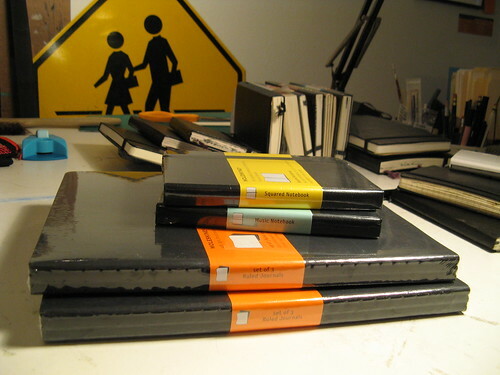 And I prefer a hot-press watercolor paper usually, so their watercolor sketchbooks don’t always work that well for me. That’s one of the reasons I modified a daily planner by refilling it with hot-press watercolor paper. But really, you cannot let my opinions steer your own experimentation. Part of the fun of art is exploring what materials work well for you, and that’s different for every person. Have fun!